Data center technology name Twilio Inc (NYSE:TWLO) isn’t exactly lacking friends on Wall Street these days. Dougherty & Co.’s Catharine Trebnick is another analyst that’s joined the bullish fray, initiating the firm’s coverage on Twilio stock with a “Buy” rating. Her thesis? The company “sits near the epicenter of enterprise digital transformation,” which she believes will translate into a revenue growth pace of 25% for years to come. That call becomes part of a consensus view of the so-far-unprofitable Twilio, which deems the stock as slightly better than a “Buy” (where a “Strong Buy” is the only better ranking). Most of those bulls were glad to tout the company’s fourth quarter revenue growth of 41%, using it as evidence to support their stance. Fair enough. With Twilio stock up more than 50% year to date, that optimism has been soundly rewarded. Just a food-for-thought question though: If earnings don’t matter now and sales growth is enough, when might profitability matter? And I don’t mean possible profitably, I mean actual profitability, which takes into account all that can and likely will get in the way between now and then. Yeah, yeah, I know — what do profits matter? This is an environment that rewards a great story. Never mind a flawed business model or the lack of a moat! After being in this business for a long, long time though, I can say that earnings only don’t matter right up until the point they do. And once they do matter, they matter in spades. And if you don’t believe it, just ask all the people who were burned by LendingClub Corp (NYSE:LC) or Pandora Media Inc (NYSE:P). Both drove plenty of revenue growth and certainly created plenty of hype. Eventually, though, they tanked when decent profits remained too elusive for too long. But you own a stock for where it’s going rather than where it’s been, right? I wholeheartedly agree, and will even concede that analysts collectively expect this year and next year to be pivotal years for Twilio. 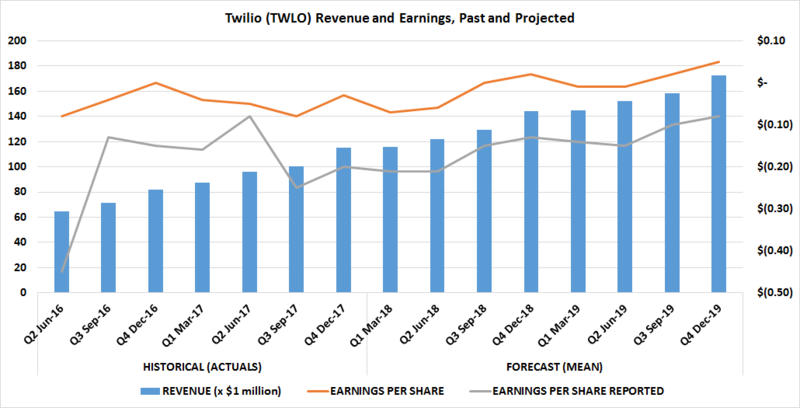 Specifically, the experts are calling for a swing from a loss of 19 cents per share of Twilio stock last year to a profit of six cents per share next year. Not too shabby. You may not want to bet the farm on that turnaround just yet though. Why’s that? Vonage Holdings Corp. (NYSE:VG) and Bandwidth Inc (NASDAQ:BAND). Those are a couple of names — among many — selling platforms that look and act an awful lot like what Twilio is. Both are slowly but surely tiptoeing onto Twilio’s turf, and if the industry proves to be a fruitful one, there’s little to prevent a bigger player like Amazon.com, Inc. (NASDAQ:AMZN) from muscling its way into the business and taking it all for itself. That’s the polite way of saying Twilio has no defensible moat to keep other players out of the game. 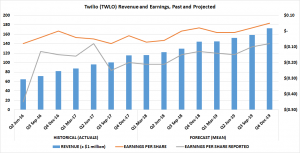 So why, pray tell, is Wall Street so optimistic about Twilio stock? One theory (my theory) is analysts may not be thinking quite as bullishly as they’re talking and are mostly just chasing — or even creating — bullishness they can later hold up as a trophy. Right or wrong, “story stocks” not only sell ads for the financial media, they can help or hurt careers on Wall Street. More than that, though, I’d recommend you take a closer look at what the analyst community is actually saying about Twilio. Yes, they’re calling TWLO stock a “buy,” but look at what’s not happened with the string of new bullish coverage and upgrades. Professional stock-pickers have not raised their price targets on Twilio stock to the same degree. Even to this day they’re saying it’s worth $39.70, which is just a hair above its present price. Far more often than not, analysts raise targets on their favorite stocks well before they reach their previous targets. Maybe, just maybe, the market subconsciously knows that even if Twilio can turn the projected profit of 6 cents per share next year, at a price in excess of $39, the stock’s still ridiculously more expensive than any justifiable valuation model suggests is palatable. Worse, even if and when Twilio gets close to moving into the black, that’s when competitors are likely to turn up the heat and wage a price war Twilio can’t win. Thing is, most Wall Streeters aren’t in a position to say anything like that. They certainly didn’t wave anybody off of LendingClub or GoPro Inc (NASDAQ:GPRO), when they had to know their futures couldn’t possibly be anything like what was being described in their early days. Article printed from InvestorPlace Media, https://investorplace.com/2018/04/twilio-inc-needs-just-strong-revenue-growth/.